I find it quite surprising that, to the best of my knowledge, no one has questioned the FIA's announcement that the manufacturers will be allowed to "re-tune" their engines to establish equality. Does it not occur to anyone that this is both an admission that the engine freeze has not worked and that the goal of the FIA is standardization? Where in the regulations does it state that engines must have the same power output? When the engine freeze was first introduced, Mosley justified its timing by saying that all the engines were about equal anyway. Nobody argued, although Honda obviously hoped to gain a small advantage by rushing through a few tweaks immediately before the freeze came into effect. It was reasonable to assume, therefore, that the race for more power from the engine was over and that customers could be fairly sure that, whatever engine they put in their cars, it would not be the difference between winning and losing. Then we began to hear muttering about the Ferrari engine somehow having increased in power and this was backed up by Toro Rosso's sudden ascendancy over its Renault-powered sister team, Red Bull. At the end of last year, the FIA confirmed this power disparity by allowing Renault to make a few "adjustments" to its engine to re-establish parity. But it occurred to some of us that the only explanation for the sudden increase in Ferrari power was that they has already made changes to their engines in spite of the freeze. On closer inspection, we found that a loophole had been used. The regulations allowed changes for reliability reasons and Ferrari had sneaked in a few that increased power. That the tweaks were never intended to assist reliability was illustrated by the increase in Ferrari engine failures in subsequent races; if reliability had been the goal, the engineers had made some serious errors! It is suspicious, at least, that the FIA never noticed this and turned a blind eye to other teams, BMW and Mercedes for instance, using the same loophole to keep up with Ferrari. One has to conclude that the governing body was not serious in its intention to prevent changes in the engines and that the excuse of cost-saving was a nonsense. If manufacturers were allowed to sneak in power increases under the guise of reliability, the game was still on and no money was saved. This year it seems that Mercedes have found some "reliability" tweaks that have given its engine more power, making it the engine of choice for all customers. And the FIA has decided to allow changes that bring parity between the engines again but under the proviso that power output will be decreased in the better engines, rather than letting the lesser engines increase their oomph. If that does not reveal the true aim of the regulations, I do not know what can. Clearly, the idea behind the engine freeze was never a saving in costs; it was always a way to standardize engines, making it irrelevant which particular lump you chose to stick in your chassis. It was a measure designed to accustom us to the idea of parity so that there would be less opposition to the spec formula that Mosley wanted to see in F1. Those who care about diversity in the sport must surely protest at the creeping standardization that is going on or we will have a sort of GP1 formula in the end, like it or not. The lesson from all this is that engine freezes do not work as long as there are several manufacturers involved. Any engineer worth his salt will look for loopholes and ways to improve his engine - F1 is all about competition and the engine designers are as competitive as anyone else involved in the sport. It is time to recognize the illogical mess that the freeze has turned into and allow development again. And, if one engine gets the jump on the others to produce more power, has that not always been the case in F1? The Matra and Ferrari V12s were always much powerful than the Cosworth V8 but the customer teams coped by designing better chassis. The Renault turbo produced far more power than the rest when first introduced but was betrayed by awful reliability. Engine power parity is, in fact, not something to be desired in F1; it is the very difference between engines that encourages fresh and innovative approaches from the engineers and designers. Let them compete - it is the only way if we want to preserve the sport. Good article as always, Clive. It makes me think. One half of me agree totally with you, but the other half, believes it was a good idea to bring the cost down on engine development. If we remove the engine freeze rules from f.ex 2011., then I think the new rules somehow should make the engineers work on fuel effiency. Maybe something like the cars have x liters/kgs of fuel per race. Maybe starting with f.ex. 80% of what they use today and then decreasing a little every year. The rest is up to the engineers. All kind of technologies are allowed. 6,8,12 cylinders,turbo , KERS, 2000 or 3000 cubic or even Wankel it all doesn't matter. To be sure we don't start with too powerfull engines the fuel amount should be at a level, so we start a little under what we have in power today. Most power from less fuel, let the best the engineers win. But the cost will probably go up again, but at least there is a chance that somebody come up with an idea that can be used in road cars. Keith Duckworth suggested a fuel flow formula some years ago in the turbo/non turbo days. I always thought it would be a good way to go and would allow teams to build any configuration it felt would be appropriate. Far too sensible for the FIA in it's current guise; not enough control or power to wield. Does anyone know at which point the Cosworth engine is frozen and will Cosworth be able to impliment "reliability tweaks" ? It does have to be said that the FIA did a tender for standardised engines in 2010. I guess they're trying to do it through the back door by getting the teams to agree to it - which will be harder than herding cats. Hopefully by the time the deadline passes, Ari Vantenen will be in power and all this silly power-chasing will be forgotten. Hezla: Agreed that we need to find a way to decrease the cost of engine development; my point is that engine freezes do not work. I am not sure about fuel efficiency formulae either - they have been tried in F1 and lead to some pretty strange situations, with drivers going slowly over the last few laps to eke out the fuel, cars running out of gas within sight of the finish and so on. My feeling is that, if we are serious about cutting costs in this area, a stock block formula is the way to go since the initial design costs have already been paid, leaving only a certain amount of tweaking that can be done. Such a formula also leads to considerable diversity as teams search for the most suitable engine to work on. Cosworth is being allowed to prepare its engine to ensure that it is competitive with existing F1 engines. This is particularly relevant in the area of fuel consumption, many observers having pointed out that the Cozzie was always a bit of a gas guzzler. The company's press releases have been very confident that their engine will be at least as powerful and fuel efficient as the rest by the time it is debuted. Alianora: So much depends upon the outcome of the FIA presidential election, doesn't it, Ali? It seems to me that raising reliability is pretty much the same as raising performance. If the moter is more reliable / more solid, the engineers can permit a more aggressive mapping of the ECU, which, over the long haul, is the equivalent. A more reliable motor can take more abuse, it can be run leaner and probably survive higher temperatures and more extremes to its variable timing. I am quite sure the cost of making a more reliable engine is equal to that of making a more powerful engine. Nick: All quite true but the problem is the standard ECU. The idea is that it can't be messed with - otherwise it makes an even bigger nonsense of the engine freeze. Good point about reliability developments being as expensive as power increases however. Clive: Are you sure that there is no adjustablity in the ECU? If this is the case how is it that teams can turn up or down the fuel consumption? In fact, if the ECU is not active why bother? Might just as well have a restrictor plate are just limit the size of the intake valves? Clive: In effect, if there is no control to be had, why would it be called an ECU in the first place? I was of the impression the idea of a standard ECU was just to stop competition in the design of of the on board computers and to reduce the FIA's paranoia about things it didn't understand. I would have thought that a Fuel Flow formula would be easier to police that the current system as all that needs checking is the amount of fuel given to the teams. I may have overlooked something though. It would also be a true green policy as many of the developments would easily be transfered to road cars. Nick: Hmmm, on second thoughts, you're correct. The ECU is just a way for the engineers to change settings while the car is still going. But that makes the engine freeze even more ridiculous since every engine is only as powerful as the risk the engineers are prepared to take on the settings. But I think we're missing something here. Consider how often we have heard the engineer tell his driver over the radio to go to setting such-and-such or take a leaner or richer setting. It seems that some functions are under the control of the driver and the engineers job is just to watch the state of the engine and the progress towards the end of the race, thereafter instructing the driver if any changes become necessary. Lee: As I understand it, a fuel flow formula would limit the amount of fuel that can be delivered to the engine in a given amount of time. So a restrictor plate or some such device would be used and the total amount of fuel on board becomes irrelevant. The problem with attempts to force the engineers to make the engine more fuel efficient is that the races become dependent upon the team having done its calculations correctly. And so we have cars going slowly or running out of fuel towards the end of a race - not something that has F1 stamped all over it. In fact, in striving to squeeze more power out of the engine, the engineers are seeking to increase fuel efficiency anyway. Given that the car can only carry a certain amount of fuel, the one that uses the allotted fuel more efficiently will have more power and still make it to the end of the race. I still think that the best way is to give the engineers a specific size of engine and let them come up with any answers they can within that limit. If we're that concerned about fuel consumption, decrease the size of the engine allowed. When the formula changed from 2.5 litres to 1.5 at the beginning of the sixties, many said that all the spectacle would go out of the sport since the engines were so small. But F1 remained highly watchable and gave us some of the best races ever. There is just as much excitement and awe in a tiny screamer shoving a car to impossible speeds as there is in a great big thunderer doing the same thing (but with different noise attached)! the viewing audience. It is why they must control the whole thing. This motor business is farcical. It is like military specs during the world war. It works so long as you dumb down the design enough. When they are done homogenizing engine design Wal-Mart might be able to build them. If they are serious about being green they should do two things. by setting a rule about B.
consumption is running big fat wings at 200MPH. i) Limit fuel - decrease the limit by 5% annually. and use only the less restricted & variable diffusers. iv) Allow non hydrocarbon fuels in unrestricted form. aero forces with huge drag just so the wheels can do the turning. 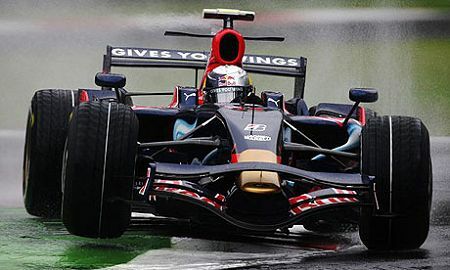 the cornering force, and not just the down force. Ok so it seems that we are talking about 2 slightly different fuel restrictions. I agree that restricting fuel flow would indeed be hard to police. However is there a reason that they can't just be given a set amount of fuel for the race? That way there is no policing required as the fuel flow is dictated by how many laps the engine can do per gallon. If they are given a set amount of fuel we will have caqrs dropping out all over the circuits on the last lap and quick cars slowing all of a sudden to let slow cars bye. Neither option very appealing to racers or fans.. If they want F1 to be a sport they must give the teams the freedom to compete, and also to give the perception of competition to those watching. Nobody is interested in getting up at the crack of dawn or paying huge amounts to watch an economy run. The speed differential between a car zig-zagging to get the last drops of fuel out of a tank while running out of fuel and a car at full speed is a rather frightening thought. If those in charge really want competition the restrictions must be loosened, not tightened. With an other restricting variable added to the equation things will get worse. Unfortunately the side effects of the designs that the rules have necessitated are strangling things. Old rubber is limiting the lanes that can be used while old air is limiting the ability to pass in the remaining space.